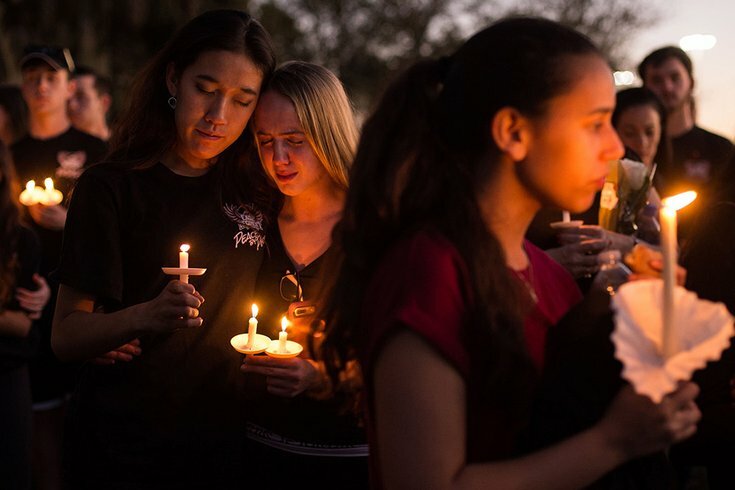 Members of the Stoneman Douglas Eagle Regiment mourn among thousands of other community members during a Feb. 15 candlelight vigil at the Pine Trails Park amphitheater, a day after a mass shooting at Marjory Stoneman Douglas High School in Parkland. Since the tragedy that took place in Newtown, Connecticut, in 2012, there have been 239 school shootings across the nation affecting 438 students and teachers and ending in 138 deaths. Countless beautiful children, teachers and administrators have had their lives snuffed out in the last six years. One thing ties these incidents together; every suspect had easy access to a gun and worse – a weapon of war. The horror that every family feels watching the carnage is crushing and we mourn the lives taken away that never truly had the chance to get started. We also feel a deep, disgusting anxiety because all of us know that without changes in federal gun laws that this will happen again and again, and we will be helpless to stop it. ...We need to make our federal legislators, especially the ones who are calling for thoughts and prayers, to get off their asses and work with their colleagues to solve this endemic problem. An AR-15, the military grade weapon that was spawned by the M-16, which gained its prominence in the Vietnam War, has been the weapon of choice to kill as many people as possible in many school shootings and mass shootings throughout the country. There was a time, not long ago, that these powerful machine guns could not be obtained through the federal assault weapons ban enacted in 1994. Nevertheless, once the gun industry and the NRA put enough lobbying money into the pockets of lawmakers the ban expired in 2004 without even a debate in Congress. The day that ban expired was the same day our federal legislators, who take millions of dollars from the NRA, turned their back on our children. Fast forward to today, approximately 8 million AR-15s are in circulation and like the Parkland, Florida shooter you only need a valid driver’s license to get one in that state. This is also a bigger problem of the more than 300 million guns currently in circulation throughout our nation. Let’s face it; it takes more paperwork and proficiency testing to get a driver’s license in most states in the nation than it does to buy a semi-automatic assault weapon with a 30-clip capacity. New Jersey’s gun laws are stringent, which we endorse and embrace, and hopefully under Gov. Phil Murphy they will get tighter on magazine capacity, safe-gun technology and stricter limits on conceal-carry. That said, the reality of high capacity firearms undermining our community is only too real. Twice in the last month in Camden County our SWAT units were called out on crimes that involved suspects using an AR-15 and a modified AK-47. Furthermore, take for example a gun trafficking bust that just took place here last week. The suspects in the case were using a straw buyer in Ohio who bought an AR-15 and AK-47s and shipped them to our county. The buyers, Chucky Scott and Anthony Hammond, got those weapons with a 25-minute background check and walked out of the gun shop, then shipped these weapons of mass destruction right into our backyard. In order to buy these weapons nothing else is needed in Ohio. And more than 30 other states accept a cursory background check to walk out of a gun shop the same day with an assault weapon. Our number one task and priority in this world is to protect our children, nothing else comes close, and in this current landscape gun proliferation makes that harder and harder. Schools should be a sanctuary for our kids and not a place that we worry about as a target for mass shootings. Throughout the developed world no other nation experiences this kind of daily tragedy because of our nation’s access to firearms. What we are asking for is federal standardized guns laws that ensure the safety of this nation, our schools and our children. We need to make our voices heard and we need to make our federal legislators, especially the ones who are calling for thoughts and prayers, to get off their asses and work with their colleagues to solve this endemic problem. Finally, it is time to take back the leverage of the NRA and gun industry. Their actions have always been about greed and gun sales, so let’s start putting citizens first again and let this be our final line in the sand. 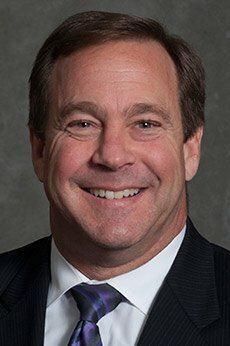 Camden County Freeholder Director Louis Cappelli Jr. is a resident of Collingswood and the architect of the Camden County Police Department.